Many universities and colleges in low-income and middle-income countries require a masters dissertation or thesis for as part of postgraduate training, and some colleges offer a 1-year to 2-year diploma of child health as a clinical qualification to enable skills in child health for generalists, or as part of the early phase of paediatric training. This paper describes the stages of doing a research project for such a masters or diploma, and describes in detail how to write a minor thesis. The paper is designed to provide a practical approach for junior researchers, and their supervisors. Colleges differ in their formal requirements of a minor thesis (word count, line spacing, referencing style), but this paper outlines the principles and practical issues rarely covered elsewhere. What is a minor thesis and why do it? A minor thesis is a written, systematic description of your project. It has a structure, and tells the story of your research: why you did it, how you did it, what you found and what it means. learn to communicate scientific research in verbal presentations and written form. Figure 1 shows many of the stages in conducting a research project. The order is not necessarily fixed, some steps, such as a literature search can be done early when considering a research question, or done later in the writing phase (often it is done in both phases). The literature review summarised in the thesis is usually focused on the research question, that is the question leads to the literature review (which is done in a systematic way). Learning about literature searching (through PubMed or Medline), learning about a reference manager database like EndNote and learning about databases and statistical analysis programs like Excel or SPSS can be done at any time, but best to start these early in the process. Not all steps are needed for some projects, such as a relatively simple clinical audit, but it is good to know what steps to consider. Stages in a research project and writing a minor thesis. A diploma of child health (DCH) thesis should address a simple clinical or public health question. It could be an audit of a condition or practice which is of interest to you. A research project often starts with an idea that interests you, or a problem you have noticed. You may have 12 months for your DCH (realistically even less, about 10 months prior to exams). The project should ideally be able to be completed in 4–6 months. This is because the main part of DCH training is developing clinical competence in paediatrics, and being a good registrar. A masters project is expected to be more involved, and should be planned early, ideally in the year before you begin collecting data. You usually have 18 months to 2 years. You should choose a topic of interest, explore what has already been written on the subject, what local research exists, in what context this has been done, talk to your supervisors and take time to identify clear research questions and choose a feasible and practical method for your study. But a masters project and thesis should not dominate your time, as the main task of postgraduate training is to develop the all-round skills to be a good paediatrician. This includes an understanding of child health epidemiology and research methods, but too much of a focus on research can detract from clinical responsibilities and clinical learning. While many students find it easy to identify a theme or topic, it is often more difficult to define a research question or questions. A research question should be objective and answerable using a research methodology. Research questions can be quantitative, qualitative or a combination of both. Quantitative research questions generate data that are measures or values, which can be used for descriptive and inferential statistics (such as ‘what are the causes of anaemia in children presenting to Kimbe Hospital?’ ‘what is the prevalence of disability among children admitted to hospital in Vientiane?’ or what ‘what is the long-term outcome for very low birth weight neonates in Honiara?’ The questions may be general (‘what are the patient characteristics of children with MDR TB?’) or specific (‘what is the success rate of outpatient treatment of moderate gastroenteritis?’ and ‘what proportion of newborns with PROM will need antibiotic treatment?’). Many questions will be objective/numerical (‘what is the case fatality rate for birth asphyxia at Goroka Hospital between 2011 and 2016?’); some will be categorical (‘what are the common types of seizures that children with epilepsy in Yogyakarta have?’). Many projects will have a mix of both quantitative and qualitative questions, and it is important to identify the differences early, so the right methodologies can be applied. Most research projects have more than one research question, and some research questions are not fully defined when you start a study, they develop along the way. However, it is important to have at least one clearly defined research question to begin. From an objective research question, the clear definition of terms and metrics of measurement are derived. For example, the population should be described in detail. A population descriptive could be as broad as ‘all children admitted to "X" hospital between March and July 2018’, or as focused as ‘infants with HIV as diagnosed by PCR testing’ box 1. It is possible to describe some studies using the mnemonic PICOT, for population, intervention, comparator, outcome and time. This applies to intervention studies, and is a way of phrasing the primary question clearly. Examples of this are in mentioned in box 1. Definition of population: VLBW 1000–1499 g, born in Honiara national referral hospital or born outside and referred to the special care nursery between January and December 2018. Nutrition: z-scores weight for length and weight for age at 12 months. The proportion of children with moderate and severe malnutrition. Motor outcomes: the proportion of children at 12 months with moderate or severe neurological deficit identified by a standardised developmental examination (such as the Bayley’s test). Sensory outcomes: the proportion of children with impaired hearing based on autoacoustic screening. Anaemia: the proportion of infants at 12 months with a haemoglobin <10 g/dL (WHO standardised definition). Infectious disease morbidity: the number of hospital admissions from infections in the first 12 months, after initial hospital discharge: these could be subcategorised into acute respiratory infections, gastrointestinal infections, febrile illnesses, etc. P—among children under 2 years of age with moderate-to-severe pneumonia or bronchiolitis presenting to an emergency department. I—does nebulised hypertonic saline given in up to three doses over 2 hours? C—compared with standard care including antibiotics, oxygen. O—result in a lower respiratory distress score and fewer children requiring inpatient care. T—over the first 12 hours. Such a description of a study is not suitable to all studies that are not controlled intervention studies, and PICOT can rarely be used to describe all aspects of a study. However, if you read a journal article abstract of a randomised trial and cannot summarise it in terms of PICOT, then it is either a poorly written article, or poorly conducted study. Broadly, there are two major types of studies—descriptive and analytical. Descriptive studies describe a problem or outcome; analytical studies describe an association between exposures and outcomes. Descriptive study designs include case-reports, case series and descriptive epidemiology. Analytical study designs include randomised controlled trials, cohort studies, case-control studies, case-crossover studies, cross-sectional studies, pre-post studies and some observational studies. What study design you use depends on many factors, including the research question being addressed, how common the condition is, whether the question is asking about short-term or long-term outcomes, how long you have to do the study, etc. You should discuss with your supervisor exactly what type of methodology is appropriate to answer the question(s) being addressed. To answer qualitative questions, there are a various theoretical approaches (eg, grounded theory, phenomenology, ethnography), but a simpler method called qualitative description is perhaps the most suitable for focusing on the experiences of patients, families and their views on care seeking, patient-professional interaction and the organisation of healthcare.2 It is a descriptive approach and is especially relevant in mixed-methods research (understanding the reasons for quantitative observations), and when time and resources are limited. Qualitative description (and other qualitative methods) use a variety of data sources (eg, interviews, case studies, focus groups). If qualitative research is part of your project, you should find a supervisor with some experience in these methods to help you design and undertake this component of your research well. Basic steps to analysing qualitative data are outlined in box 2. Verbatim recording of responses from interviews, focus groups or observations. Coding of this information, deidentifying where appropriate to ensure confidentiality. Recording insights and reflections on the data. Sorting through the data to identify similar phrases, themes, patterns, opinions and also identifying where these differ or diverge. Gradually deciding on a small group of common themes that address the question, or generalisations (such as opinions or commonly reported practices) that hold true for the population studied. Examine these generalisations in the light of existing knowledge and/or quantitative data. Presenting the data according to themes, described in an objective way, with the verbatim responses from subjects as evidence for that generalisation. This helps to ensure that the analysis stays close to the informants’ points of view. An important element in successful research is the development of a data analysis plan. An analysis plan informs how you organise your data. It ensures your data collection form will have questions designed specifically to address your research questions, and that resultant databases are set up to answer your research questions. It is useful to develop a data analysis plan with your supervisor prior to designing any data collection tools, in order to ensure necessary questions are included in the most appropriate format, and that you understand the statistical tests you will be using. With guidance from your data analysis plan, the data collection forms should will be designed to answer your research questions. The database should be developed early and checked by you and your supervisor to ensure it reflects the data collection forms, and that it is easy to enter data and analysable in order to answer these questions. Some quantitative variables will have a numerator and denominator, and you should identify these. Identify the metrics clearly and early, and ensure you record them consistently (do not mix up metrics in your spreadsheet, such as recording some ages as months and some as years, or some weights in grams and others in kilograms). If there is more than one metric for an outcome—such as the definition of severe malnutrition, which may differ depending on age and tests done (weight-for-age / weight-for-height / mid-upper arm circumference / body mass index) then have four columns each labelled as the separate metric, and a ‘summary column’, which is binary 1/0 if severe malnutrition, based on whether the appropriate metric is present. All studies should have ethics review. This is mandatory for publication in a peer-reviewed journal, and needed to fulfil the international standards of ethical research (Declaration of Helsinki 1964). Ethics approval is usually not required for a systematic review of previously published research, but most masters theses require an original research project with primary data collection. Research ethics is not meant to be a barrier, but an enabler of good research that is in the patients’ interests. There are a number of ethical principles that all researchers should adhere to, including consent, autonomy and human dignity, confidentiality, non-maleficence (doing no harm), beneficence (maximising good outcomes), justice and scientific integrity.3 4 It is good to learn about ethics along the way, as this can help you be a good doctor and paediatrician, as well as a good researcher. Begin to write your thesis early, just making a start is a big hurdle. You will have done a lot of work in the proposal stage, so use that document and expand on it. Organise your computer, with a separate folder for your study and thesis documents. Allocate time each week to work on your study or writing. A masters study and thesis are best done over an extended period of time, and it is good to keep making some progress each week. Trainees sometimes have a writer’s block, or their study falters, or they become discouraged if they leave it for weeks or months. If you do something each week you maintain the threads of thought and keep others around you interested in your study, and it is good for your morale! Registrars who leave their project or writing to the end do not get as much out of their research experience as those who work steadily on it over 2 years, keeping clinical and research training requirements balanced. Each research project will have a number of questions, some major or primary outcomes and some supplementary or additional questions. They should be described clearly in the methods of the thesis and you should be able to identify them in your data collection form, your database and your thesis. Your supervisor is a busy person, with clinical, teaching and other responsibilities. But your supervisor should feel involved in your study, so keep them up to date on your progress, discuss problems with them early and listen to their feedback. Sometimes small research obstacles can be overcome easily if you discuss them, but if you keep them to yourself they become magnified in your mind. A problem shared is a problem halved! Communicate with your supervisor in person and by email, share your thesis writing with them. You should plan to meet your supervisor regularly; while some of these meetings will be to discuss clinical aspects of your training, set aside some time to focus on your project specifically. Sometimes your clinical supervisor will be different from the person who is supervising your research project. If you feel you are not getting the support you need from your supervisor, contact the masters coordinator or the professors to seek more assistance. Often this will be because your supervisor is busy, or may not be sure of how to help you—it is not because they do not want to! Do not let problems go unaddressed—always ask. Write one master document, which can be used for the initial technical and ethics proposal, then expanded during your study to form your thesis, or sometimes adapted as a report to a funding agency, and concisely revised as a journal article you may write after completion of the study. Some people use multiple documents for each of these purposes and have multiple thesis versions on their computer. That is OK if it works for you, but it can be inefficient and confusing. The advantage of using one master document is that when you update or revise it, add a table, figure or reference or correct an error, everything gets updated and you do not have ‘version confusion’. You will inevitably end up with a couple of versions: first the proposal, then use that document to expand to a thesis document, then a paper you might write that is based on your study. Clearly name (and date) each type of document and each version, for example, Audit of antibiotic use Masters project proposal Your Name February 10 2018.doc and Audit of antibiotic use Masters thesis Your Name May 6 2018.doc, or a file name that clearly indicates what the purpose of the document is and when it was written or revised. Discuss version control with your supervisor(s) early in your research project—ensure you all agree on a system. A good method might be for you to date each version, and when your supervisor(s) review or edit your work, they add their initials to the file name. This ensures it is clear who has worked on the document. Ask your supervisor to ‘track changes’ so any suggested edits are found easily. Set up a folder that contains all the separate documents for your thesis, do not just have them randomly scattered in your computer. Back up the latest version of all thesis and study documents regularly, and keep the backup flash-drive or external hard drive in a safe and secure place. On your backup drive, only have your project documents, and do not use it in other people’s computers to minimise the risk of viruses. Backing up your data and study documents on cloud storage can be useful if you have reliable internet access: Dropbox is an open-access program, which provides free (up to 2 GB) cloud storage (https://www.dropbox.com), Google Drive is another method for cloud storage of documents for security in case your computer malfunctions. Cloud storage also enables sharing of documents with your supervisor. In a thesis write in the past tense. A study proposal (ie, for a study not yet underway) is usually written in the future tense: "In this study we plan to recruit 30 children with asthma. Children with acute intermittent asthma and chronic persistent asthma will be eligible. Children with a past history of Tb or bronchiectasis will be excluded". In a thesis the same information in the past tense reads: "In this study we recruited 30 children with asthma. Children with acute intermittent asthma and chronic persistent asthma were eligible. Children with a past history of Tb or bronchiectasis were excluded". Writing should be concise and clear. I find it useful to read sentences out aloud to myself and ask, is the meaning clear and unambiguous? It is useful to ask someone else to read over your thesis at the end; not necessarily a medical person who is familiar with the topic, but an educated person who writes well (such as a teacher or scientist in another field). A thesis should be written in language that people without specific knowledge of the subject can understand. There is no one right way to write a thesis, but there is a generally accepted structure which has a number of major parts. A thesis can be written with these major parts as chapters, or as one document like a journal article with major subheadings. The major parts are mentioned here in this article. A very brief (total 250–300 words) overview of the whole minor thesis. It usually has a structure (introduction, method, results, conclusions), each part with just one or two sentences. The abstract should fit on one page. It should state clearly the research question, the study type, the main method, the primary results and a conclusion (one to two sentences) based on the primary result. The abstract does not need references. Introduction should state why you did the study, why it is an important topic to research. This may only be three to four paragraphs, especially if you have a literature review which follows. The introduction provides contextual information as to why you did the study. The introduction can highlight the burden of the disease or condition, why it is an important one in your country or in the region or globally, why it is important for your specialty. Your introduction may outline whether the condition or topic has been well studied or neglected in terms of research or study, and identify the gap that will be addressed by your study. In a DCH thesis, you might just write about why you became interested in the topic because you cared for a patient with the condition, or you are seeing a lot of such problems in your ward or hospital, etc. In the introduction, you should state clearly the objectives of your study, and the research question(s) being addressed. Literature review is a summary of the existing knowledge of the research topic. It should be focused, on the general topic and specific research question being addressed. In doing a literature review, keep notes on the search terms you use and on the search engines used (eg, PubMed, Google Scholar). For accessing full-text articles, papers are increasingly published as open access and you can access these through these search engines, however if your university or hospital has registered for Hinari program set up by WHO (http://www.who.int/hinari/en/), and you have good internet band speed you will have access to thousands of other journals and ebooks. In the opening paragraph of your literature review state how you did the search, for example, "I searched the published literature using PubMed and Google Scholar using the terms ‘asthma’ ‘spacer device’ ‘salbutamol’ ‘treatment’ ‘metered dose inhaler’ ‘home-made’ and ‘developing country’ or ‘low and middle income country’". While there are formal methods of searching for information using standardised key words, phrases and MESH terms, when you are starting out with literature searching, try to make the search reflect closely your research question, and record exactly the words you use in the search. Usually a literature review is written from ‘general to very specific’; the opening paragraph outlines the previously published information on the burden of the condition or the magnitude and significance of the problem, then subsequent paragraphs focus more narrowly on the previous literature on your specific research question(s). A good literature review integrates existing research under themes or subheadings, rather than having a series of paragraphs which just state what previous studies have found. A literature review may be structured thematically and have subheadings to identify themes. For example, a literature review for a study of the role of home-made spacers for asthma could start with the literature on the burden/prevalence of asthma in the community, and a paragraph about overall treatments (beta-2 agonists, corticosteroids), another about mechanisms of drug delivery (oral, metered dose inhalers, nebulisation), one about the effectiveness of spacers and their availability in certain areas and then focus specifically on the existing literature about home-made spacer devices. It is not necessary to write everything about asthma, but focus the review on the question you are studying; start general and move to very specific. Sometimes there may not be much literature on the subject you are studying, that is OK, just summarise what exists and highlight the gaps. There is no need to ‘pad out’ the literature review with peripheral information, make it relevant, concise and informative. See references and reference manager program (below) to plan how to organise and cite your references. In most journal articles, the literature review is incorporated into the discussion (and a little by way of background in the introduction). This can be the case in a minor thesis, but it is up to you. Most people find it easier to have a separate section, which is the literature review at the beginning, but there are no fixed rules. explain any methodological problems and how they were addressed. Results are presented as narrative, tables, graphs and figures. There are no fixed rules, except the results should be organised and logical. Unless it is very important and central to your thesis, it is best not to duplicate the exact result in each medium of presentation (eg, the same information—such as the baseline characteristics of the study population presented in a figure, table and narrative). Tables can provide a lot of detail and be informative; if presented as a written narrative, this can make the results too long and be tedious. The narrative should highlight the main results, describing in detail the outcomes for the primary research question, important secondary outcomes and orientate the reader to the tables, graphs and figures: explain what they describe, their main findings (without describing every detail). Each table, figure or graph must be referenced in the narrative (eg, ‘see figure 2’) at the appropriate point in the narrative, or this can be written as ‘table 1 describes the baseline characteristics of the children with asthma’, then describe in narrative the key baseline characteristics, but other details can be left for the reader to discover from examining the tables. It is often thought that the results cannot be written until the study is complete. While this is partly true, it is important to plan and organise the results section early. Put subheadings into your thesis document that will help guide your subsequent analysis and writing. Draw up ‘dummy tables’ that contain the variables you want to report even before you have analysed the data, but leave the cells which will contain the numerical result blank. You may add other variables later, but drawing up such tables as you do the study will help you organise the presentation of results. There is no fixed limit to the number of tables a minor thesis can have, but avoid duplicating data in the tables and the figures, and avoid a figure or graph that describes an obscure or unimportant aspect of the study. You do not have to include every result or data point that you gathered in the results, this can make a thesis seem to be lacking perspective, you may not ‘see the wood for the trees’, that is, you may miss the really important points because of too much information being reported, and the reader will find it tedious to read. The analyses of most diploma and masters studies involves primarily basic descriptive epidemiology, rather than the need for any complex analytical tests, like regression or p values. It is important to get the descriptive epidemiology right, describe the population or subjects in the study in a logical way, numbers, percentages or proportions, median or means, ranges, IQRs or CIs. Be clear about numerators and denominators. Denominators will sometimes be different depending on the variable being described, and the number of observations made. It is not useful to have p values for every statistic, and many good thesis can be written without p values at all! For some analytical tests, such as the comparison of two proportions to determine if they are different (5 of 83 children in grade 1–4 have asthma, whereas 9 of 206 children in grades 5–7 had asthma) a p value can be useful in indicating whether an observed difference is likely to have arisen by chance. For the presentation of most analyses of a comparison between groups, CIs are much more informative than p values. Avoid the trap of reporting multiple p values and the mistaken view that finding a p value of <0.05 is ‘significant’. If you do enough statistical tests a p value of <0.05 will arise merely by chance, not because a real difference exists. A p value alone cannot determine that a hypothesis is ‘true’, or if results are important. Only report p values and other analytical tests on your primary and major secondary results if indicated. Avoid using p values to report minor post hoc results (findings from your study that you did not plan), these are often just chance findings that reflect unanticipated bias or confounding. Unanticipated post hoc results may be interesting and generate further hypotheses for another study, but they should not be interpreted as definitive or conclusive. Often inexperienced researchers or readers assume that a ‘significant p value’ is conclusive when it provides preliminary information only. So do not overinterpret your results or fill them with p values and obscure statistical tests, but describe the findings clearly and concisely in plain language. The results section of a minor thesis does not have to be long, it can be one to two pages of narrative, and can have subheadings for each of the relevant results. Discussion is an interpretation of the results, what they mean. The discussion should return to the objectives and the primary research questions of the study and indicate whether they have been achieved. The discussion should be organised into thematic paragraphs or sections, and subheadings can be a good way to guide the reader. The first paragraph of the discussion should restate the main result(s) of the study in plain language (without statistical tests). The discussion should compare the results with previous studies or pre-existing knowledge of the subjects. It should not duplicate the literature review (but it can link to this), but the discussion should cite other research where the results can be compared or contrasted with your own. Other research may be in different contexts (different populations, different level of resources, different methodologies, different outcomes measured). It is important to understand why two different studies addressing the one problem may yield different results, it does not mean that one study is inferior or inadequate. The primary outcome or question is usually addressed in the first few paragraphs (with comparisons with other research if appropriate) and then secondary outcomes discussed (with similar comparisons). Write in ways that indicate you are scientifically open to unexpected outcomes, and understand the uncertainty of your study. Do not write, for example: "I did this study to prove that probiotics reduce the duration of watery diarrhoea", but rather ‘this study was done to evaluate whether probiotics would reduce the duration of watery diarrhoea’. Similarly, do not be too categorical or certain: ‘this study proves that steroids should be used to treat chronic otitis media’, rather ‘in this small study of school aged children with chronic serous otitis media, topical corticosteroids reduced the duration of purulent ear discharge’. A discussion of the shortcomings or limitations of the study is appropriate. Every study ever done has some limitations, so it does not mean you have done a poor study, just because there are some limitations. You should be honest about the limitations, but do not overstate them either (ie, it is not necessary to make excuses for a study). This is especially the case for so-called ‘negative studies’, that is, studies that did not find a difference or a significant result in the primary outcome; such studies can be just as important as ‘positive studies’, so you should not feel such a study is unworthy. Furthermore, you should not try to highlight an obscure post hoc p value that is <0.05 in order to give your study ‘significance’. In the limitations section, try to identify if there are any systematic biases or confounding in your study; this will help you avoid overstating the results. In reading other papers for your literature review, and for your own research, beware of the risk of type II error; the finding that there is ‘no difference’ when this could be due to a small sample size (a study that is underpowered to find a statistical difference, even when one exists). Again, for a DCH or masters thesis, do not worry if your study seems ‘too small’, it is the quality of the work that is important, and this will not be judged solely on the number of patients recruited into a study. No new results can be introduced in the discussion section; if in writing the discussion you find a new result that you want to include or comment on, you need to incorporate it in the results section first, and then you can make comment on it in the discussion. The conclusions should be brief. Return to the research questions and suggest whether they have been answered or solved, and what the main finding was. Return to the objectives of the study and suggest if they have been achieved. Indicate what has been learnt from the study and how it might be applied. And indicate any clear recommendations that you think can come out of your study, which may be a change in clinical practice, increased awareness of the topic or problem, the adoption of your research method into everyday practice or the need for further research to be conclusive about a finding. Any important statement of fact in the thesis should have a reference; this is obvious in the literature review, but applies equally to the introduction and discussion. References are not usually included in the methods, unless you are referencing another investigator’s method that you have used, or a statistical test or program that you used. Appropriate references may be journal articles identified during your literature review, or books or websites. When referencing a fact or finding from a journal ideally go to the original research paper which identified the finding, not an opinion paper which just repeated the finding. Ideally, you should get a copy of the full-text (not just the abstract) of the article that contains the finding that you are reporting as a fact, to verify that the paper did indeed say that. This is a type of fact checking that is good to do. There are many ways to reference a thesis, references can be cited in the text as numbers (eg, 3, 5, or [3, 5]) or (authors name, year). It does not matter as long as it is consistent throughout the thesis. I find the (authors name, year) format can make it hard to read the text if there are many references interspersed throughout the paragraphs. The numerical citations are more acceptable for the vast majority of journal styles, so it is best to do it this way, so it is easier to revise your thesis into a journal article. There are various standards for referencing, including the Harvard Referencing Standard. There is no source document for Harvard style, but many universities have their own guidelines based on the Harvard style, such as Adelaide University: http://www.adelaide.edu.au/writingcentre/referencing_guides/harvardStyleGuide.pdf. It is best to have a reference manager program, which can make reference lists in a particular journal style for you after you input the references from your literature search. There are many such programs now, including EndNote (www.endnote.org), which is used by a lot of scientists and clinical researchers. Using EndNote you can import citations directly from Google Scholar and PubMed searches, and you can download the full-text article if it is Open Access. EndNote is a commercial product, but other reference manager programs are freely available. Zotero is a free, open-source reference manager with cloud backup into which you can manually insert citations or extract citations from internet search engines (https://www.zotero.org/download/). Other programs include Mendelay (https://www.mendeley.com/) and ‘Cite This For Me’ (http://www.citethisforme.com/harvard-referencing). It takes a bit of work learning how to use EndNote or Zotera and how it links to Pubmed and Google Scholar and to learn how to insert references into such a program, but it is well worth it. When referencing a website, you should state the title of the website, the title of the web page, the exact URL and the date you accessed it. If in your thesis you include or adapt tables or figures from another source (such as a website), you need to reference these. Journals have different styles as to the number of authors listed in a reference. Some, if a reference has six authors or less include all their names. If a reference has seven or more authors just include six names, then ‘et al’. There is no fixed order or content of the pages of a thesis, but box 3 is a guide. An excellent thesis does not need to be long, it can be anything from 4000 words (a bit more than the length of an original research journal article) or up to 20 000 words or more. It is not the length that indicates the quality of the work. A DCH thesis should generally be shorter than a masters thesis, aim for 3000 words maximum in a DCH thesis with 2–3 tables or figures and references. The full title of the thesis. The full name of the candidate. The name of the school associated with the research. The year the thesis was submitted. Except where acknowledgement has been made, the work is your own. The work has not been submitted previously, in whole or in part, to qualify for another degree or assessment. Any educational material used in the study. Anything included in the appendices should be cited in the text of the main thesis, so the reader understands why they are included, for example, "We used a survey form that included basic demographic information, questions on frequency of asthma, asthma severity, previous hospitalisations, medication use, whether the child has an asthma action plan and what method the child used for taking Ventolin (see appendix 2)”. The reader can then refer to appendix 2 to see exactly what questions were asked. It is really important that a postgraduate diploma or masters thesis be all your own work. It is too tempting these days to cut-and-paste information from Wikipedia, journal articles found online or other internet sites, but this is plagiarism and it is unacceptable and a form of cheating. Sometimes plagiarism occurs inadvertently if you are unsure of what the university standard is, or sometimes it occurs when people are under stress of deadlines. Regardless, it is always unacceptable. If you start only writing in your own words you will not fall into the trap of plagiarism. Do not directly copy anything from another source, but write it completely in your own words and add the original source as a reference. Many universities use programs like Turnitin to check for plagiarism. Another good program is Grammarly, which is both a Grammar and Plagiarism check. It is available at https://www.grammarly.com/1. It often takes several rounds of revisions to get a paper in shape for submission, but you should aim to write your thesis in a format where the most important or original data are publishable. You may not be able to include all the results or text in a journal publication. Brevity is important, and often ‘less is more’. Ask your supervisor about writing up your thesis for submission to a journal. The author would like to thank Professor Mike English (Kenya Medical Research Institute), Eleanor Neal, Dr Jocelyn Chan, Dr Hamish Graham (University of Melbourne) and Dr Bob Phillips for very helpful comments, and to the postgraduate students for their inspiration and examples. This paper drew on a number of sources, including ‘Minor thesis and research report structure’, from the Study and Learning Centre, RMIT University: http://mams.rmit.edu.au/8zbeww6e1n3i.pdf (accessed 11 February 2017). There is a book by Paul Gruber and Justin Zobel from University of Melbourne, which the author could not access, but this may be a useful reference. 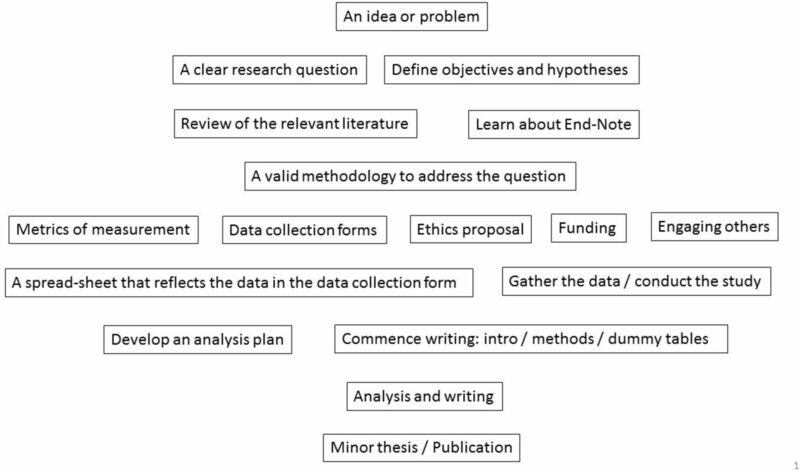 ‘How to write a better minor thesis’ Melbourne University Press, 2014 (https://www.mup.com.au/items/135100).
. Introduction to qualitative research methods: a guidebook and resource: John Wiley & Sons, 2015.
. Critical reflections on the principle of beneficence in biomedicine. Pan Afr Med J 2012;11. Funding The author gratefully acknowledges the RE Ross Trust for support to child health research training in Papua New Guinea and the Pacific, which is the basis of this work.